ZFK showed Shane Meadow’s 80’s skinhead drama and this is the graphic we used for the posters etc. I think it’d make a great shirt. 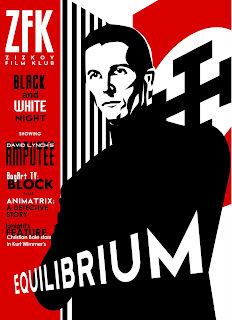 Poster for the ZFK screening of Equilibrium. The theme of the movie, one man’s stand against a totalitarian regime, suits my art style perfectly. I actually think it would be an interesting idea to re-make the film in the style of Renaissance (the animation not the art movement). This is a movie we made from the bits and pieces left over from ‘The Man Who Locks the Door’. There were no special effects used on Rory’s head. I’ve always been a huge fan of David Fincher’s. Even the much underrated ‘the Game’ was magnificent and his upcoming movie (five years after Panic Room) looks like its going to be one of the highlights of the year. Fincher has a vision not to be interfered with (Fight Club, Se7en) and the respect for him in the industry is such that he can not only get some of the best actors in the business to work with him but he has the sort of power that can hold a film back from being entered in time for the Oscars so that he can fine-tune it. Respect.